EndNote is a reference manager, it allows you to store references and the papers that you use in your research. In EndNote you can read and annotate the papers, share and discuss with colleagues and supervisors. The Word plug-in or even the Open Office editor helps you to write your papers, create citations and your reference list. Installation of EndNote is offered via Zenworks for ITC staf, also via notebook service centre, software pages (login required). Section, software manager, next, Data management. You could also download EndNote for the mobile phone. If you don't see your EndNote toolbar in Word, please run once the option: Configure EndNote. It is not necessary to uninstall EndNote before installing a new version of EndNote. 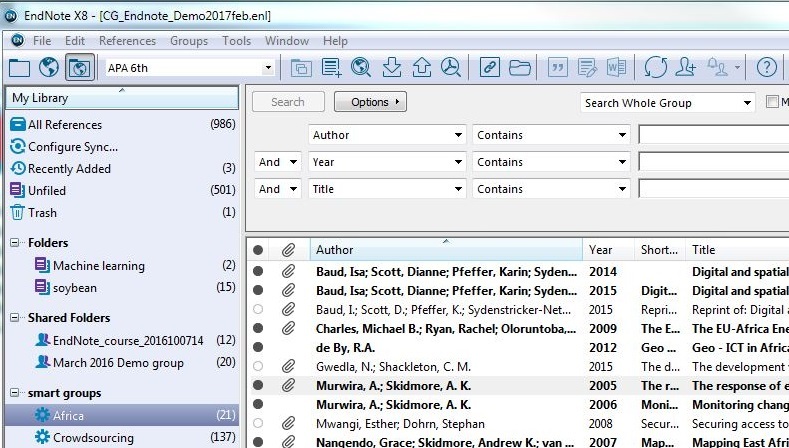 There are more tools like EndNote but ITC decided to support Endnote and Mendeley actively. Other programs are for example Mendeley (www.mendeley.com/) and Zotero (www.zotero.org/). Both are open source software; Zotero is a Firefox extension. For technical questions please contact the IT helpdesk and for other questions you may contact the ITC Library. Early 2017 EndNote 8 was made available, this version has a totally new look and feel. Functions are the same. Installation of version 8 can be done next to version 7, please be aware of this. BibTeX is a tool for managing references so that they can be formatted using the LaTeX document preparation system. LaTeX is widely used in the physical sciences and engineering to format documents containing formulas, equations, etc. BibTeX references are stored in plain text files, with the file extension .bib (e.g. references.bib). It is easy to convert references from your EndNote library into BibTeX format. This technique can also be used when a database does not support download in BibTeX format. In such cases, download the references to EndNote and then convert them into BibTeX. Select the references in your EndNote library which you want to convert to BibTeX. Go to the EndNote Style Manager, and select the style BibTeX Export. Click on File and select Export. When the dialog box opens, choose a name for your file and the location where you wish to save it. The file must be a text file (*.txt). In recent versions of EndNote, you must select the output style at the bottom of the Export File Name dialog box.